MOREHEAD, Ky. — The Morehead State football program has finalized its 2017 schedule. The 11-game slate features five home games and six road contests. MSU opens the season at home against Kentucky Christian on Thursday, Aug. 31. After an off Saturday on Sept. 2, the Eagles will travel the following week to face Big South Conference foe Liberty on Sept. 9. Morehead State has not played Austin Peay since 2006 when the two were in the Pioneer Football League together. The Eagles and Governors, who square off in Tennessee on Sept. 16, also played for several seasons in the OVC together. 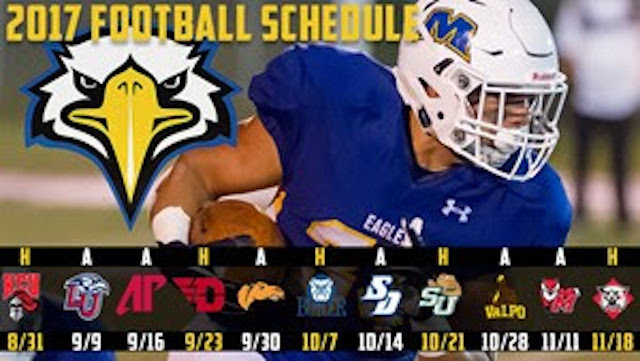 Game times, ticket information and promotions will be announced at a later date on MSUEagles.com. Morehead State will host Pioneer Football League opponents Dayton (Sept. 23), Butler (Oct. 7), Stetson (Oct. 21) and Davidson (Nov. 18). Family Weekend is set for the Dayton game, and Homecoming is slated for the Stetson contest. Other road contests include Campbell (Sept. 30), San Diego (Oct. 14), Valparaiso (Oct. 28), and Marist (Nov. 11). The opening round of the FCS Playoffs is set for Nov. 25. Morehead State finished the 2016 season 4-7 overall and 3-5 in the PFL. Eleven players were named All-PFL, and four of those are expected to return for 2017. All-Conference returnees include offensive linemen Kyler Corbett and Liam Maloney, defensive lineman Colt Briggs and cornerback Braylyn Cook. Spring practices officially begin on Monday, March 27. Updates on MSU football can be found on MSUEagles.com, Twitter.com (@MSUEagles and @MSUEaglesFB) and Facebook (MSUEagles).